You may have never heard of Hope, Minnesota. But at one time tiny Hope was a hub of activity, back when dairy farmers brought cans of milk to creameries by horse and carriage. It was so time-consuming to transport the milk that creameries sprang up about every three miles. 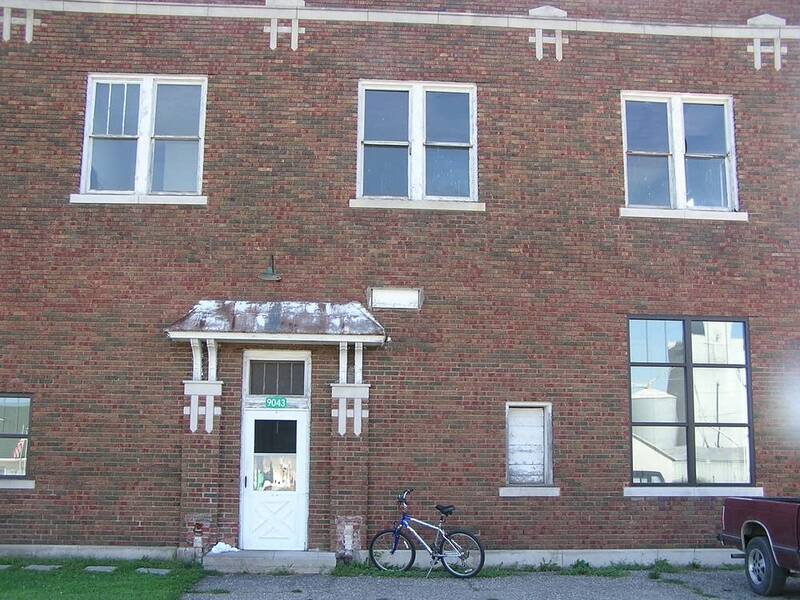 At one time you could find 30 creameries dotting the Steele County landscape, among them, the Hope Creamery. The creamery still churns out butter in a 1920s red brick building. The old butter-making techniques are supervised by Gene Kruckeberg, a tall, slim man dressed all in white. He started making butter in Steele County 48 years ago. "Yeah, that's right. January 1, 1958," Kruckeberg said. Kruckeberg has not seen much change on the job. Sure, the milk used in Hope Butter today comes by truck, not horse and buggy. The milk comes from a farm in Hastings, not from neighboring dairy farms. But the milk is still pasteurized for a full day. The cream is then skimmed off the top and pumped into an old 900-gallon motorized batch churn. The ingredients remain simple: well water, cream and perhaps a bit of salt. Then the churn is turned on. Initially the churn turns quickly, but it slows as the small curds of butter begin to separate and become heavier. The process takes about 45 minutes. Gene Kruckeberg and his crew generally make butter only once a week. During the churning process, Kruckeberg watches and listens to cues that will him by sound whether the water content is right. "As soon as the water's worked in you gotta quit rotating it, otherwise the butter gets sticky. You gotta keep an eye on it. I mean, you can't just walk away from it, let it churn and come back," Kruckeberg said. 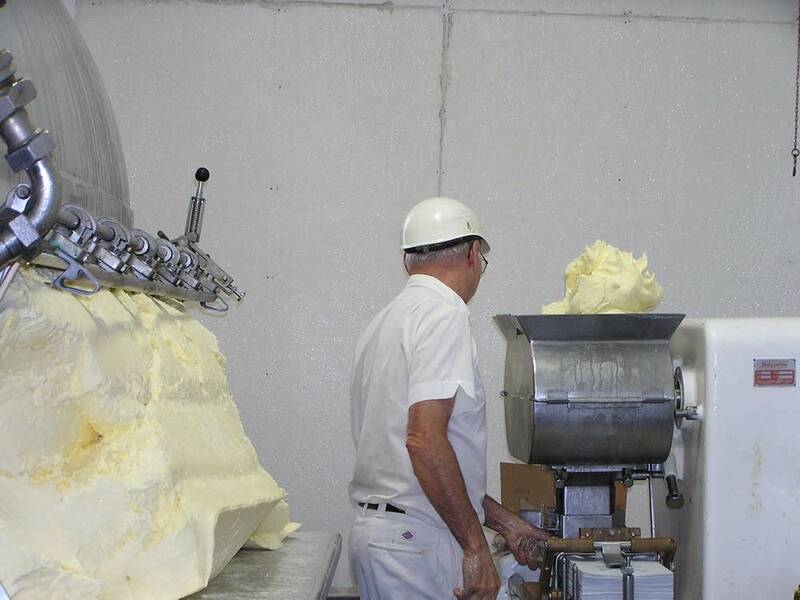 Hope Creamery makes about 5,000 pounds of butter a week. That's a fraction of the volume manufactured by large producers like Minnesota-based Land-o-Lakes. "Nowadays, all the large plants have continuous churns, where the cream comes in one end of it and it comes out a ribbon of butter on the other end. It's a real fast process, or real fast churning," Kruckeberg said. Once the butter has finished churning, Gene Kruckeberg and his crew dip their arms and hands into a trough full of water and sanitizer. Then they scoop the butter out of the churn by hand, and throw handfuls of the pale, yellow butter into an old-fashioned butter-wrapping machine. The butter looks different from the typical sticks sold in grocery stores. The color is paler and there are no chemicals or dyes enhancing its yellow hue. Many Twin Cities chefs report the butter tastes different too. Chefs at restaurants like Lucia's and The Cue at the Guthrie are using Hope Butter in their cooking. "We don't have as much milk solids in our butter the way the continuous churn butter does. So when they melt it, it's more clear butter, not as many milk solid specks in it. That's one reason they like it. Plus the taste," Kruckeberg said. Kruckeberg boasts that his product competes with butter produced in Europe. Critics often cite European butter as having superior taste and texture. It also has a higher fat content than typical American butter. 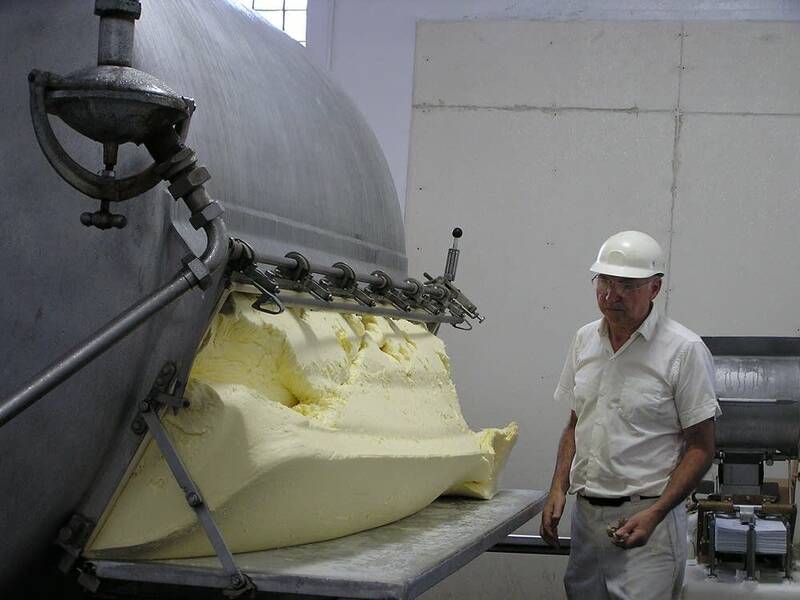 In fact, Hope Butter produces an extra high-fat content version of butter that chefs use in making pastries. More fat means there's less moisture in the butter, and that results in flakier pastry and a fuller flavor. Victor Mrotz, the owner of Hope Creamery, grew up near the creamery and ate the butter as a child. Mrotz and his wife bought the creamery in 2001. Mrotz says he's happy with his product, and with the fact that he's preserving jobs in this rural farm town. Some of his workers are calling Mrotz a hero for saving the creamery. "Hero is a strong word I guess. Heroes are people who run into burning buildings," he says. "I ran into a falling-down building. Maybe that's what it was." Twin Cities grocery stores Lund's, Byerly's and Kowalski's sell Hope Creamery Butter. 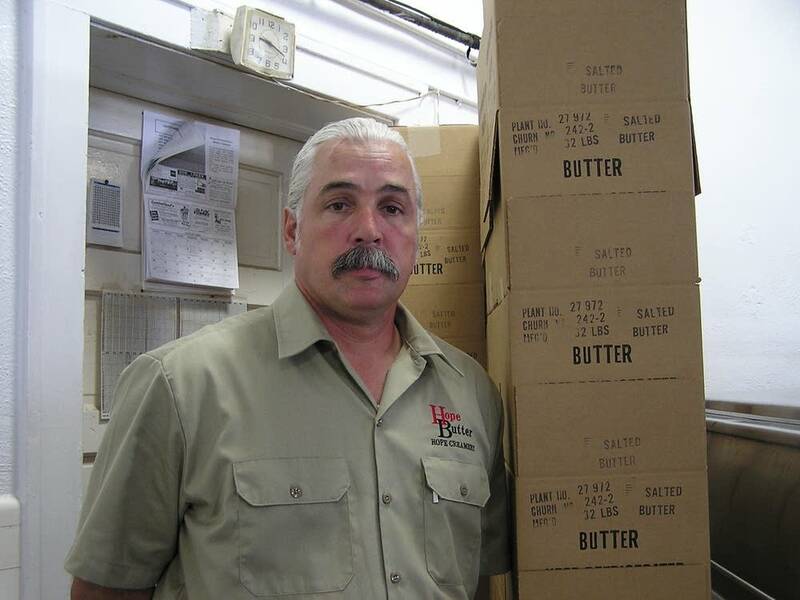 Mrotz says he's hoping to expand his company and distribute the butter throughout the region. Greta Cunningham is a reporter, newscaster and host for Minnesota Public Radio.